distribution Occurs over most of the Coastal Plain and adjacent Piedmont, ranging inland only to Warren, Durham, Chatham, and Moore counties. Seemingly absent in the extreme eastern Coastal Plain, at least in most tidewater counties around the Albemarle and Pamlico sounds. Ranges north to New Jersey, but very rare and sporadic west of the Atlantic Coastal Plain, though there are a few records west to Oklahoma and Texas. abundance Probably uncommon, to locally fairly common, over its range in the Coastal Plain and eastern Piedmont. Duncan Cuyler collected large numbers of this species, in several dozen counties, and thus it is not (or was not during his time) a rare species. 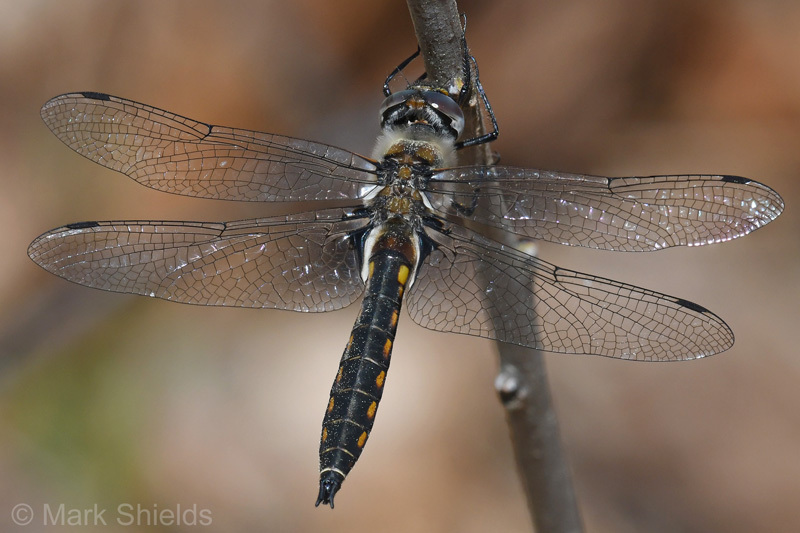 However, most observers today are either unfamiliar with it or are reluctant to report it, due to difficulty of identification from Common Baskettail. Of note, Cuyler found it "fairly common" in the Dismal Swamp area. flight Spring season only, with the flight finishing about as early as any dragonfly species in the state. This flight period in the Coastal Plain is from very late February or early March to early May, and in the Piedmont from late March to early May. The latest state collection record is 4 May (likely the earliest "latest" date for any odonate in NC). Not surprisingly, Dunkle (2000) says "the earliest dragonfly within its range". According to Roble and Cuyler (1998) -- "Cuyler's surveys in North Carolina indicated that this species is fairly common at ponds, swamps and streams of all sizes; adults were found from 17 April to 7 May in western Gates County ... and the Dismal Swamp region ..."
habitat Still waters of swamps and ponds/pools in or near forests; probably scarce in open water of lakes and ponds. behavior Males patrol along swampy edges; little else reported. comments Though the species averages slightly longer, huskier (especially in the abdomen), and more hairy in the thorax than Common Baskettail, identification of Robust Baskettail must be made with care, as there are many photos of Common Baskettails (presumably) from the mountains and Piedmont with wide abdomens and very hairy thoraxes. Even though the NC Natural Heritage Program ranks the species as S3? in NC, few people other than Duncan Cuyler are familiar with the species in NC. This "unfamiliarity" extends throughout its range, as Paulson (2011) says "The sparseness of records south and west of North Carolina is puzzling" and "seemingly rare in most parts of range". This suggests that most of the records rangewide are from NC, and the species is likely much more numerous here than to the north and south. Despite over 105 records with dates for NC (data from the University of Florida museum), the Natural Heritage Program retained the species on its Watch List until 2018, when it was removed owing to an increase in records in 2017-18. Thankfully, Conrad Wernett has netted and photographed several individuals in the hand, in Craven County. Mark Shields, John Petranka, Brian Bockhahn, and Kyle Kittelberger have also added a handful of new recent records, with photos. Comment: Hoke, 2018-04-04, Lumber River at the US Hwy. 401 bridge; Wagram Boating Access. - Male feeding over a backwater area. Comment: Wake, 2017-04-01, Robertson Millpond Preserve, Robertson Pond Road, eastern Wake County. - Male. Patrolling short beats low over the water near the earthen dam. Photo shows spines and downward-angled distal end of cerci.